When Google said so long to the Google Search Appliance, we went to the market to find a replacement. We chose Mindbreeze. Here’s why. While it’s true that more content moves to the cloud each year, the majority of our GSA customers still keep most of their enterprise content on premise. Several of the search vendors in the market, including Google, have set a very cloud-heavy product direction. While there’s nothing wrong with that, the reality is that most almost all of our GSA customers need to index on-premise content. Some customers, although a smaller portion, also have requirements that the search solution itself must be on premise. Even those who are open to putting their search index in the cloud must still overcome the bandwidth challenges of indexing large volumes of content across the internet. 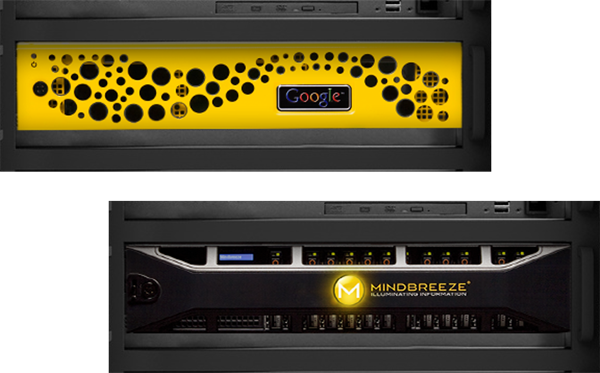 Mindbreeze, like the GSA, is a search appliance installed on premise and is well suited to indexing both on-premise and cloud content. While Mindbreeze does offer a hosted version of their Mindbreeze InSpire search product, we typically recommend customers with mostly on-premise content run Mindbreeze on premise. A hybrid architecture is also available where customers can index on-premise content on-premise and cloud content in the cloud, then federate the results at serve time. Reason #1: Even as Mindbreeze expands to index and serve more content in the cloud, they are committed to long-term support for their on-premise search appliance. An essential requirement for all but a few of our customers is the ability to connect to non-web-crawlable data sources using connectors. This includes SharePoint, file shares, databases, and many others. This also includes Oracle WebCenter Content and PTC Windchill, both specialized content management systems around which Fishbowl has dedicated implementation practices and which are used by many of our customers. To index these systems, Fishbowl developed highly specialized connectors tailored to these sources. We’ve also written GSA connectors for YouTube, Oracle Documents Cloud Service, and Liferay portal. As we evaluated possible GSA replacements, two things were very clear. First, we needed a solution with a strong suite of off-the-shelf connectors, and second, we needed a solid framework for building custom connectors. Mindbreeze has one of the best collections of pre-built connectors on the market, something they have been commended for by both Forrester and Gartner in their respective search vendor reports. Off-the-shelf connectors for Mindbreeze include SharePoint, file shares, LDAP, databases, Salesforce, Confluence, and dozens more. The Mindbreeze Data Integration connector leverages the Talend ETL platform to create integration jobs that extract, transform, and load data from proprietary sources into Mindbreeze without requiring a source-specific connector. Mindbreeze also has a mature SDK available for developing custom connectors to any data source. Fishbowl has already released a connector for Oracle WebCenter Content built on this framework. Last but not least, Mindbreeze supports existing GSA version 4.0 adapters and GSA feeds allowing customers to reuse existing integrations leveraging these frameworks. Reason #2: Mindbreeze has one of the best collections of pre-built connectors on the market plus a mature SDK for custom connector development and support for ingesting GSA feeds. Some of our customers use GSA for only public content, but for most customers, at least some of the content is secured. In certain cases, specifically when dealing with SharePoint, Oracle WebCenter, or PTC Windchill, complex security models with layers of inheritance must be enforced. 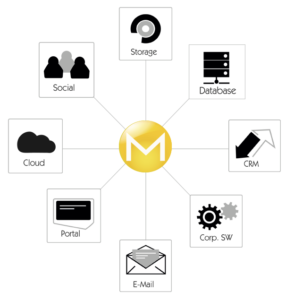 Mindbreeze offers multiple options for implementing secure search. Their internal principal cache and authorization mechanisms allow for fast, document-level authorization checks at serve time using access control lists (ACLs). Mindbreeze also supports ACL inheritance from container objects to further improve performance. For example, if permissions change on a Windchill folder containing 50,000 items, only one item, the folder container, must be reindexed for the new permissions to be reflected within Mindbreeze. This was also possible with GSA, but is not possible with many of the search products on the market because permissions can only be assigned to individual content items. Mindbreeze also supports multiple user authentication mechanisms including Kerberos, Trusted Peer, SAML, and cookie cracking. Existing cookie-based GSA authentication mechanisms can be re-used with Mindbreeze making that transition even easier. Several of our customers use a single GSA to serve both internal (secure) and external (public) use cases. This is also common with Mindbreeze due to their client service architecture which allows configuration of both authentication requirements and data sources for each client service. Reason #3: The Mindbreeze architecture provides one of the most flexible, well-performing secure search implementations we’ve seen, while also allowing segmentation to serve public and secure results on a single deployment. Once data is indexed, it is also necessary that the search technology offer both a built-in search interface and options for integrating search functionality into other websites and applications. Mindbreeze provides a nice combination of pre-built search apps and APIs for creating your own. Customers looking for the easiest path to value can leverage the default Mindbreeze search client which offers a feature rich, mobile friendly, search interface out of the box. You can add your own CSS file for a customized feel with very little development required. Mindbreeze also includes a Search App Designer which provides drag and drop tools for creating use-case specific search apps without coding. The Designer library includes widgets for adding filters, charts, grids, and galleries to various search apps. Mindbreeze also includes an export option which provides all the code needed to embed a search app into a website or application. For customers seeking a more customized integration, the Mindbreeze REST API allows search results to be returned as JSON giving you full control over their presentation. In many cases, customers with custom-built GSA results pages can keep the look of their existing frontend and swap out GSA for Mindbreeze on the backend. In fact, we recently had a customer do exactly this. Reason #4: Mindbreeze offers a solid combination of UI tools including a no-coding-required UI builder and a REST API for fully customized search applications. Coming from the easy deployment world of GSA, it was important we select a replacement that didn’t require complicated server farms, lengthy IT projects, or significant resource allocation. While we don’t encourage customers to completely forget about their search appliance, the set-it-and-forget-it mindset was prevalent among GSA customers for good reason. Once configured, it just worked. We needed a solution that offered comparably easy setup and maintenance. We didn’t set to out with a requirement to find another physical appliance, but the nature of our requirements made the Mindbreeze search appliance a natural choice. 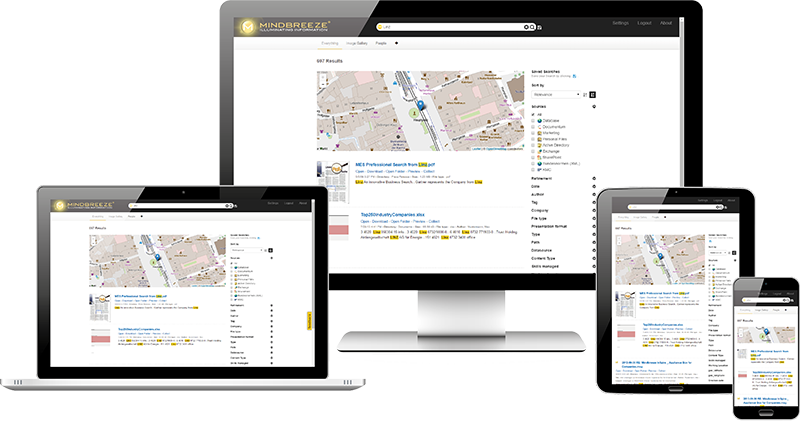 As a productized hardware-software package Mindbreeze setup is comparable to GSA and is considerably quicker than most other search solutions on the market. Even connectors can be run directly on the search appliance eliminating the need for additional application servers. High-availability and disaster-recovery architectures which automatically synchronize data between multiple appliances are also available similar to the mirroring options available with the GSA. And while we have found Mindbreeze to be more configurable than GSA in many ways, customers don’t need to understand indexing pipelines, relevancy algorithms, or machine learning to see great results. Adding connectors, configuring search apps, mapping synonyms, and viewing search analytics can all be done from the web-based Mindbreeze Management Center. Reason #5: The self-contained nature of Mindbreeze allows customers to get search up and running quickly and minimizes ongoing administration activities. You might have noticed a few things conspicuously missing from our list of key requirements. These included strong relevancy, custom synonym dictionaries, search filters, and type-ahead suggestions. Mindbreeze offers all of these features. And so does everyone else. While these features can be critically important to a good search experience, they didn’t end up being important selection criteria because all the leading search tools have them. In many cases, Mindbreeze makes it quicker or easier to implement these features (see Reason #5) but the features themselves are not unique. I should also mention that these capabilities can be huge differentiators when comparing Mindbreeze to search options that come “built in” to content management systems or line of business applications, but those products are not the search tools we were comparing in this evaluation. In the past seven years we’ve helped numerous customers buy, implement, and maintain their GSAs. Despite the disruption caused by the GSA’s end of life, we’re excited about the possibilities Mindbreeze has to offer. If your requirements are similar to ours, we believe that Mindbreeze offers the quickest, most mature, and smoothest migration path from GSA. As a Mindbreeze partner, we offer both resale and implementation services. If you have questions or would like to know more, please contact us or leave a comment below.